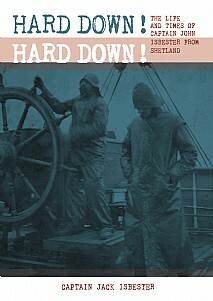 Hard Down! Hard Down! describes the eventful life of a Shetland man in pursuit of his ambitions – to reach the top in his profession, to find a wife, to cherish a family, to do his job well and to be respected by his peers. The account is enlivened by extracts from numerous well-chosen family letters, diaries and postcards revealing the minutiae of shipboard and family life 120 years ago. These include a bachelor night out in ’Frisco, buying slippers in Dantzig and a captain who changed his underclothes at midweek because he could not remember which weekend his wife had suggested! After four years as a fisherman in the stormy waters around Shetland, John Isbester chose to spend his next forty years in large square-rigged sailing ships from Liverpool at a time when shipping casualties were all too common. Remarkable feats of survival and tragic deaths are described with clarity and detail. Happier times are also remembered with picnics in Sydney harbour with captain, family and friends transported in the ship’s longboat, rowed by the eight apprentices. John Isbester’s wife, and sometimes their children, sailed with him on several year-long voyages accompanied by her upright piano. Her letters provide an extra dimension, describing conditions ashore in Sydney, ’Frisco, Antwerp and La Rochelle. She also describes the birth aboard ship of her ninth child! Extracts from the diary of an observant young Scots solicitor on a voyage from Liverpool to Sydney provide many insights into the nature of life aboard a large square-rigged sailing ship on a long voyage. The author, also a professional mariner, has compiled a record of the life of his grandfather from diligent research of shipping records held in the many parts of the world to which John Isbester sailed. Technical issues are illustrated with numerous diagrams for the reader and there are new insights into the loss of the Dalgonar and the acclaimed saving of 26 of the crew. This historical biography will be of interest to all seafarers and everyone with an interest in sailing, ships and shipping, maritime history and memoirs.